We are amongst the distinguished organizations highly involved in presenting a broad array of Dapping Punches to our valuable clients. Precisely designed and fabricated using optimum quality materials and latest machines, these products are widely acclaimed in the market for their superb quality. In addition to this, our patrons can avail these products from us at very nominal rates within the promised time frame. Made of properly harden and highly polished top quality English steel by the firm of W. Durston LTD of High Wycombe, Great Britain. 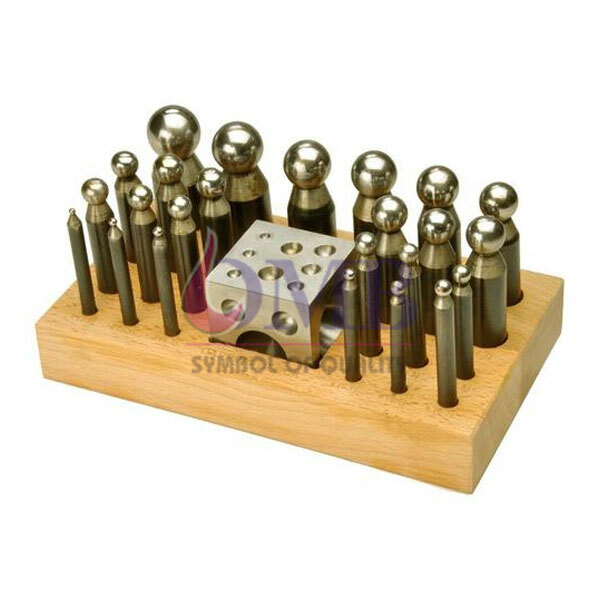 Durston continues to add to their line of tools with this medium size set of matched dapping punches with a flat die on a handy plastic stand for keeping things in tip-top shape. The 21 punches range from a 3.0mm (1/8″) to 36.0mm (1-3/8″) and they are all highly polished and well made from English steel for a lifetime of use. These sets have been selling extremely well in the EU as they compare with the German and Italian makes in quality but sell for half the price. This set is the same set as the 125.008 Large Durston matched dapping punch and die set but without the 3 largest dies. This set contains 21 punches, sizes 3.0mm, 4.0mm, 5.0mm, 6.0mm, 7.0mm, 8.0mm, 9.0mm, 10.0mm, 11.0mm, 12.0mm, 13.0mm, 14.0mm, 15.0mm, 17.0mm, 19.0mm, 21.0mm, 23.0mm, 25.0mm, 28.0mm, 32.0mm and 36.0mm. Spherical depressions on flat block are 3.0mm, 4.0mm, 5.0mm, 6.0mm, 7.0mm, 8.0mm, 9.0mm, 10.0mm, 11.0mm, 12.0mm, 13.0mm, 14.0mm, 15.0mm, 16.0mm, 17.0mm, 19.0mm, 21.0mm, 23.0mm, 25.0mm, 27.0mm, 30.0mm, 34.0 mm and 38.0mm. The plastic stand with handle measures 11″ wide by 6-5/8″ wide and when the punches are mounted stands 7-1/2″ high.